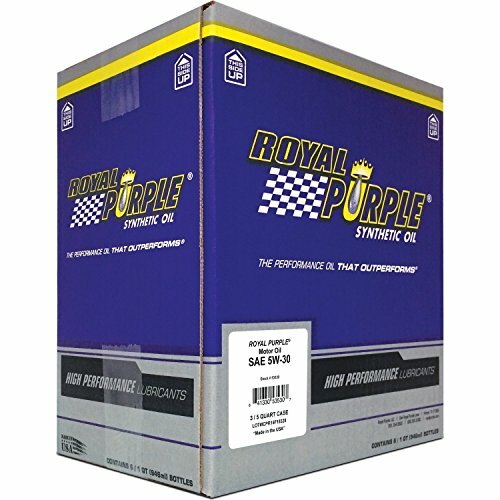 Royal Purple API-Licensed Heavy Duty SAE 5W-30 High Performance SN Synthetic Motor Oil is fully synthetic - not made from crude oil like traditional motor oils. It's used to lubricate, clean, and cool engines with the utmost efficiency. Motor oil varies in weight and viscosity, as well as additives that some manufacturers add to the oil during the refining process. A numerical code system created by the Society of Automotive Engineers (SAE) grades motor oils according to viscosity--the higher the number between 0 and 60, the more viscous (thicker) the oil is. This oil has a weight of SAE 5W-30, meaning it has an SAE viscosity rating of 5 in cold temperatures and a rating of 30 at normal operating temperature. Always check your vehicle's owner's manual to verify that this is the correct weight of motor oil for your vehicle. Synthetic oil can be used in vehicle engines instead of motor oils refined from crude oil, and often provides superior mechanical performance over traditional motor oil, including increased gas mileage and reduced engine wear at extreme temperatures. Its complex method of production means it can often cost more than conventional motor oil. Royal Purple Motor Oil Combines premium base oils with proprietary additive technologies to create high performance motor oils that optimize engine performance and provide superior protection. No special procedures are necessary when upgrading to Royal Purple. Royal Purple motor oil is fully compatible with mineral or other synthetic oils. Royal Purple recommends waiting until the manufacturer's first scheduled oil change in new gasoline engines before upgrading to Royal Purple. Royal Purple's API licensed motor oil delivers superior protection and improves performance in gasoline and diesel engines. Royal Purple's API SN licensed motor oil meets ILSAC GF-5 and Dexos1 performance requirements.